Time stood still for Mary White. A dark lonely boreen led to the Spartan farmhouse that was her home for close on one hundred years. Her unmarried brother had died some time previously and she lived alone. A paraffin lamp lit the darkness and the open fire was constantly ablaze. The wind buffeted the house and deprived her of any creature comfort. She braced herself against the elements to visit her outside toilet; a basin of water would suffice if she needed a wash. She stubbornly resisted change. In her seventieth year she had electricity installed and even then, she limited its use. A single bulb hung from the cracked ceiling, yellowed by the smoke, from her only source of comfort. No mod con would ever make its way into her home. This was how she lived and she knew no different. She was a quiet woman and a creature of habit. She had no family or friends and kept her distance from her few neighbours, but they were there for her when she needed them. Every Friday, Pat O Neill drove her to collect her pension from the Post Office. Once collected, she indulged herself in her only source of pleasure: a pint of Guinness followed by a glass of whiskey. She left her home every day to make the five-mile journey into Limerick. The crossroads at Clondrinagh was not an official stop for the bus from Shannon but the drivers bent the rules for their elderly passenger. She thanked them with a nod and sat silently in her seat. The Saturday Market was her favourite place-a place of childhood memories and the only link to her past. Within those gates she was a different person and every week she wore a stylish hat. Her tall thin frame weaved its way through the stalls and she discovered her voice when it came to negotiating a bargain. She had a keen eye and knew quality when she saw it. Many a farmer crossed her at his peril and she would only buy from those who earned her trust. Those who knew her best would call her Moll. 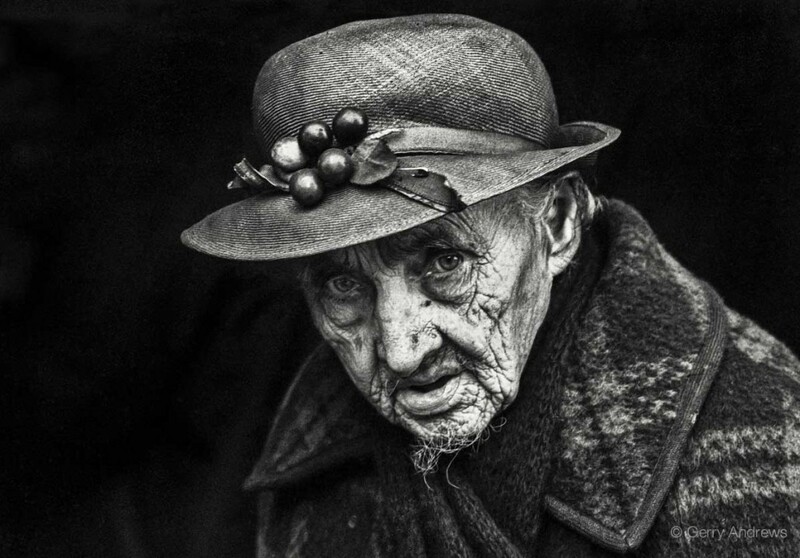 She once told me that her mother was born just after the Milk Market opened in 1857, a short few years after the Great Famine killed one million people in Ireland. Nearly a century had passed since a young farmer and his wife heard the first joyful cry of their baby girl. Her passing went unnoticed that bleak winter’s day. A frantic search for a grave, an empty church, a funeral mass without tears and a few neighbours to shoulder her coffin. Her simple life was over: no stone to mark her resting place and no family to grieve. Now a photograph of her hangs above the hustle and bustle of the refurbished Limerick Milk market, a tribute to a hard lived life and a single reminder of Moll’s presence on this earth. Moll’s story is reminiscent of so many Limerick man and women, who lived out their lives unnoticed and almost forgotten. Thank you for keeping Moll’s memory alive. I saw Gerry Andrews exhibition, in Dublin. I am so moved to see his photos, that I am now writing an article about him for an Italian magazine. Thank you.